The kids enjoyed watching the standard gauge Lionel trains run on their tracks at an exhibit this past weekend. The detailed trains had working lights and one even made a whistling sound. Evan would freak if he saw that! He loves trains! Wow! That is so detailed! I bet they loved it! Looks like fun! Thanks for visiting my blog! What a great train display. My daughter would have liked that. My boys love those trains - we have a little one we put up under the Christmas tree. I think it gets a full year of use in the month of December! My son LOVES trains! What a great exhibit. That is what he wants from Santa, trains, trains, and more trains! Thanks for entering the Zhu Zhu Pet giveaway at www.guessingalltheway.com, good luck! It's really neat to see one of these going around a Christmas tree. My daughter would love this. She loves trains. Thanks for stopping by my blog. Stop by anytime. Merry Christmas! 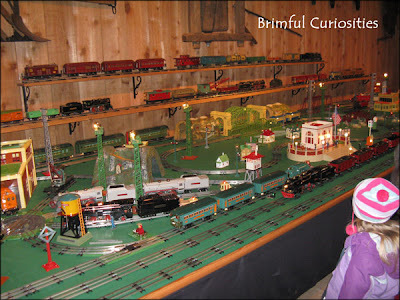 One of the reasons we love the holidays - trains on exhibit all over town!